I had the honor of chatting with Penelope in her cozy Crown Heights apartment on September 16, 2017. Listening back to the audio, I was reminded of my own rawness and of Penelope’s generosity and creative curiosity. 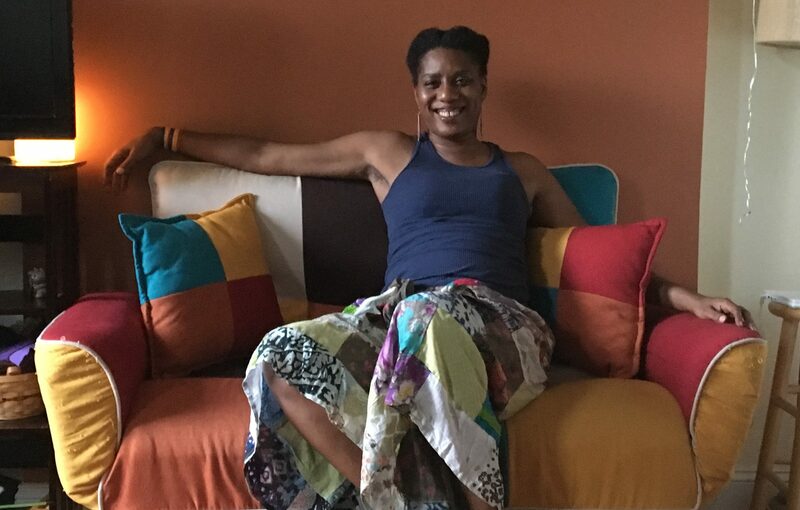 Penelope McCourty has 20+ years’ experience as a facilitator of creative process and community sharing through the art forms of dance and performance. She has worked artistically and administratively with several locally and nationally known dance companies and community arts organizations. As a performer, she has worked with local and touring companies including Marlies Yearby’s Movin’ Spirits Dance Theater, Spoke the Hub Dancing, Liz Lerman Dance Exchange, the Shakespeare Theater Company, Stephen Koplowitz and Reggie Wilson/Fist and Heel Performance Group. Her choreographic work has been presented at St. Mark’s Church, Joyce Soho, Chicago’s Links Hall, BAX/Brooklyn Arts Exchange, DIA NYC, BRIC, DanceSpace, Towson University and San Francisco State University. Penelope received the 2014 NYU/Steinhardt School Exemplary Teaching Artist Award and the Elders Share the Arts Visionary Artist Award for her work as an arts educator. She currently lives in Brooklyn and is the middle and upper school dance teacher at The Berkeley Carroll School in Park Slope. She also teaches residencies and professional development workshops through New Victory Theater, Park Avenue Armory’s Artist Corps, Elders Share the Arts and Madison Square Park.